The Little Blind Shop by Rose Creek Design has 30 years of experience in interior design and the home furnishings industry. The owner, Karen Anderson, is an award-winning designer, who has been published in House to Home Magazine and Inspired Home, among others. Karen's design philosophy is to put the customer first. She focuses on being a good listener in order to achieve her client’s needs. The Little Blind Shop is your one-stop source for all of your interior design, window fashions and home décor needs. As a Hunter Douglas Showcase Dealer and Certified Installer, we are able to assist you in your selections of quality products and exclusive collections, and to ensure the installation is flawless. Our distinctive services are provided with a local flair since we're independently owned and operated out of Fargo, ND. We take our long-term commitment to the community seriously. Just ask our clients, most of who are returning clients, of their level of satisfaction. We are here now - and we'll be here in the future when you need us again. Call on us for your next design project! 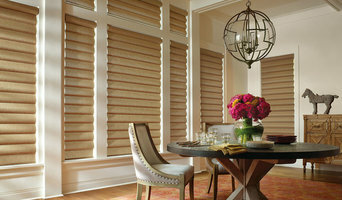 Locally owned and operated provider of custom window treatments. Shop for your home in your home. Free in-home consultation.